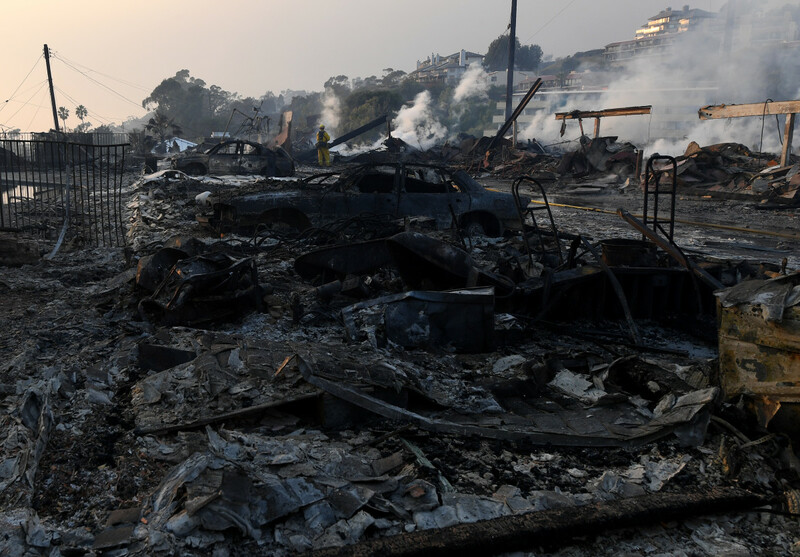 The Thomas Fire tore into Ventura early Tuesday morning causing more than 27,000 people to flee their homes, while burning an area roughly three times the size of the island of Manhattan. 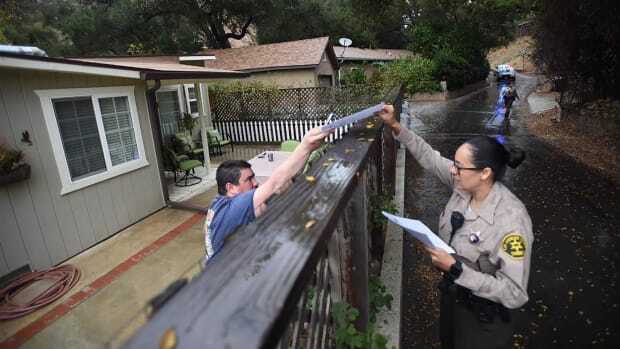 As of Tuesday evening, the fire was still 0 percent contained, despite more than 1,000 firefighters being engaged in attempting to combat the flames, according to Ventura County Sheriff’s Department spokesman Tim Lochman. 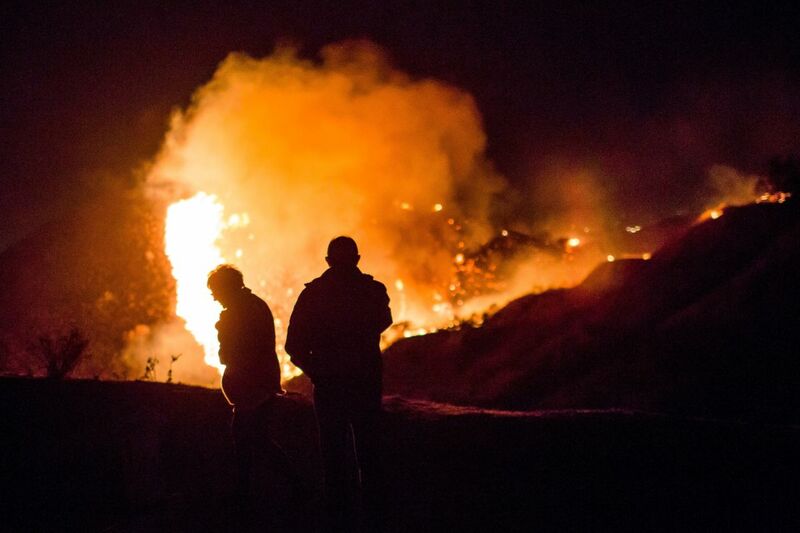 Strong winds are contributing to the effects of the fire as a red flag wind advisory warns of gusts of up to 70 mph on the ridges that surround the affected area. 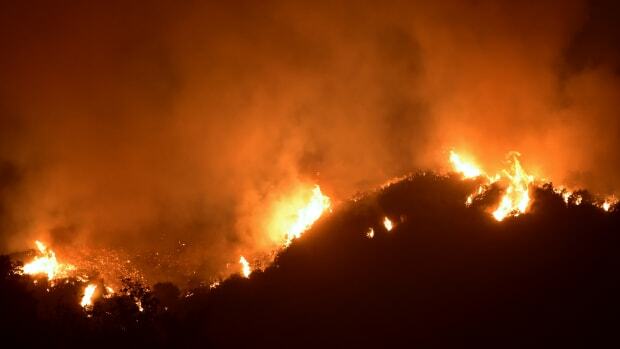 Flames continue to burn through Ventura, and firefighters face an uphill battle in their attempts to contain the blaze. 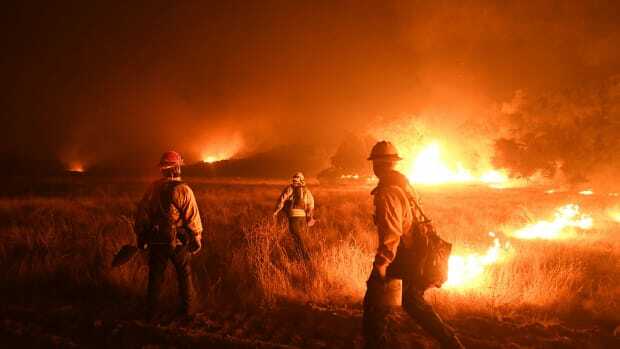 Their difficulties are compounded by two other wildfires: the Rye Fire, in Santa Clarita, which has spread across 7,000 acres, and the Creek Fire in Sylmar which has burned 11,000 acres itself. 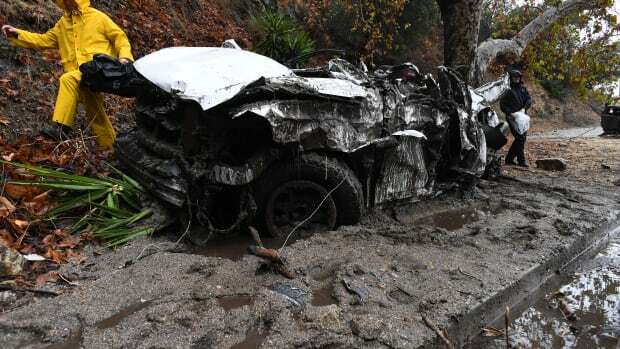 Below are images captured from the harrowing effort to combat the Thomas Fire and Creek Fire throughout Tuesday, and the devastation left in the wake of the blazes. 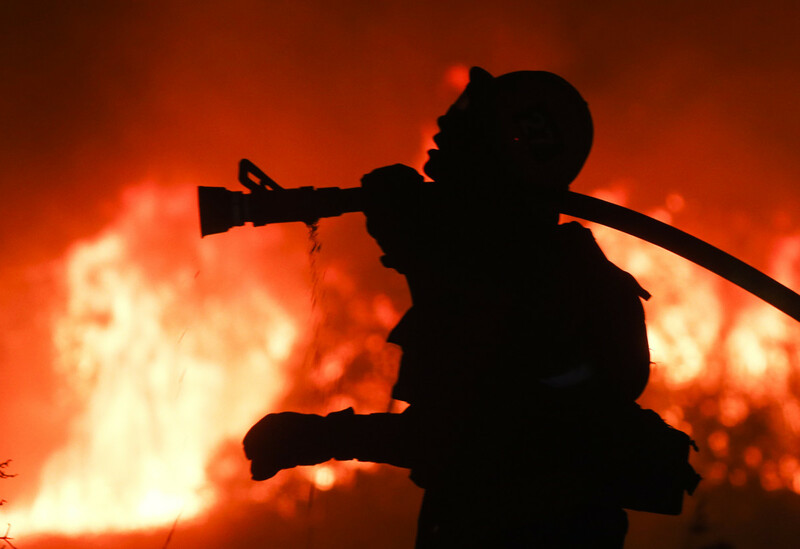 A firefighter battles a wildfire as it burns along a hillside near homes in Santa Paula, California, on December 5th, 2017. 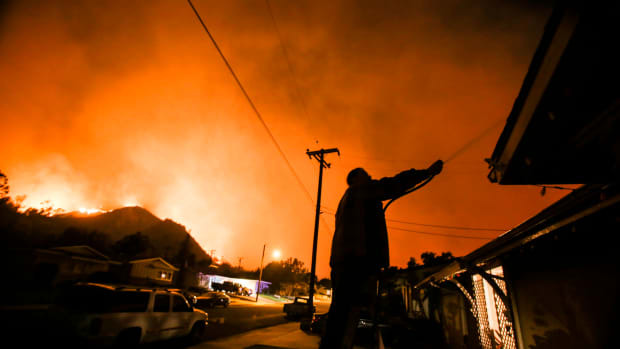 A man prepares to evacuate his home as a wildfire burns along a hillside near homes in Santa Paula, California. 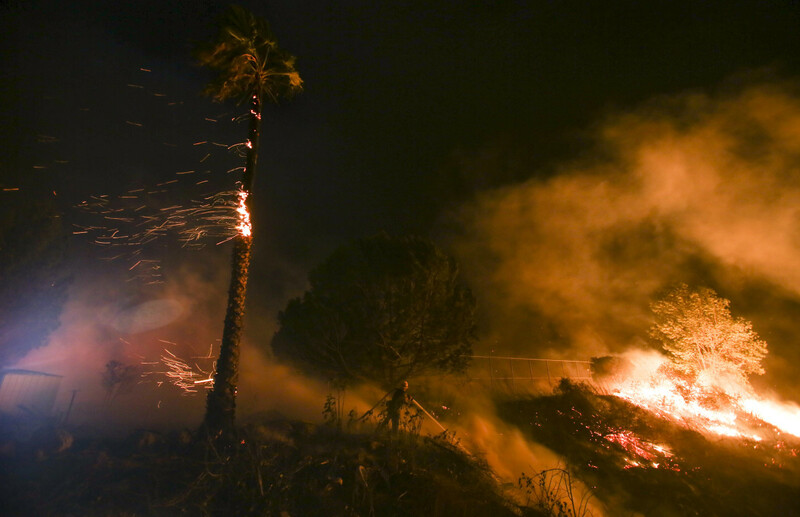 A firefighter battles a wildfire as it burns along a hillside near homes in Santa Paula, California. 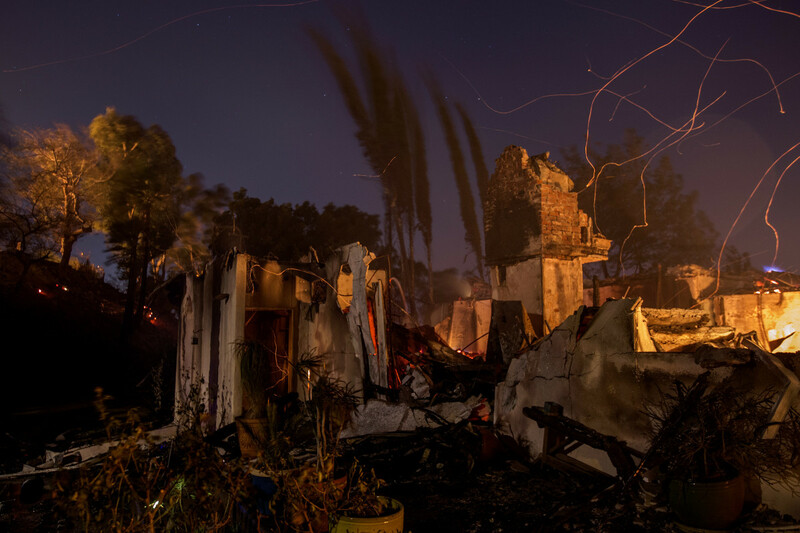 A man waters his home as firefighters battle a wildfire as it burns along a hillside near homes in Santa Paula, California. 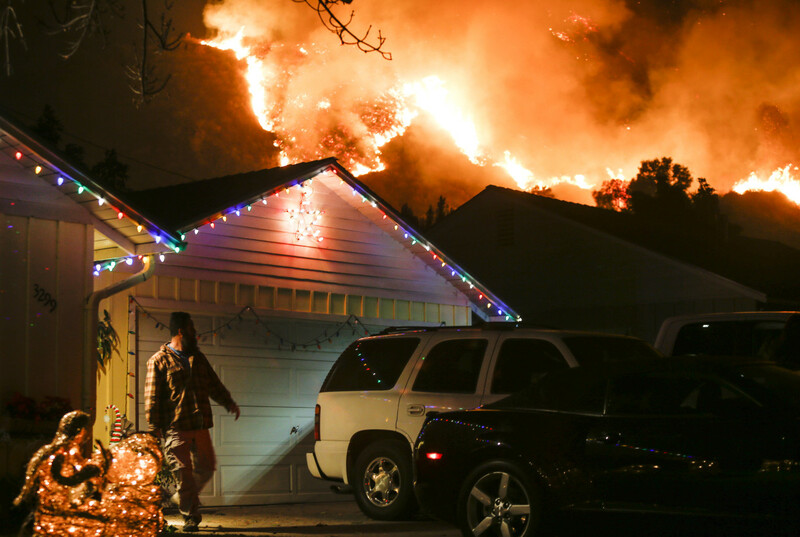 A house burns to the ground during the Thomas wildfire in Ventura, California. 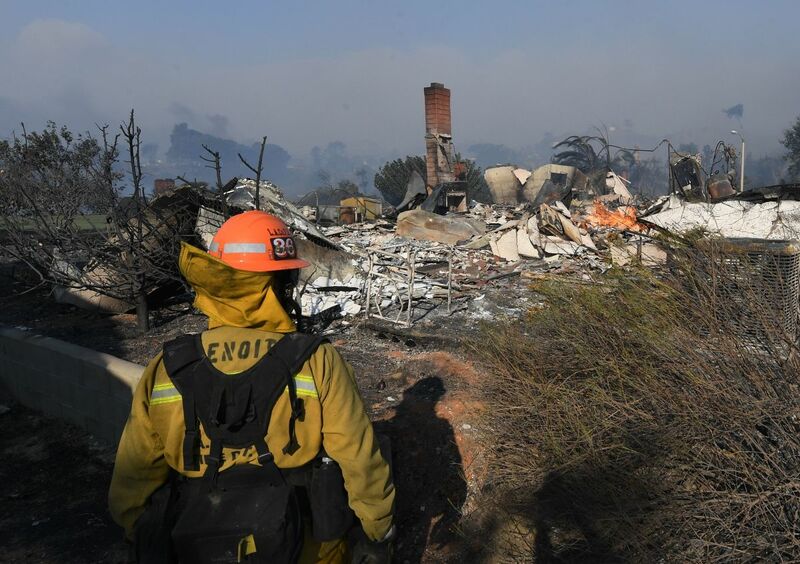 A firefighter looks at a house burnt to the ground during the Thomas wildfire in Ventura, California. 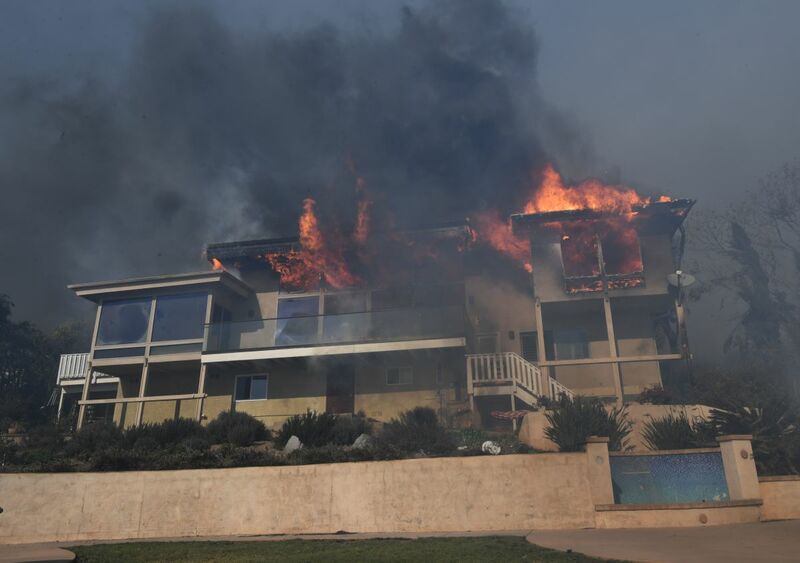 The aftermath at the two-story Hawaiian Village Apartment complex after it burnt to the ground during the Thomas wildfire in Ventura, California. 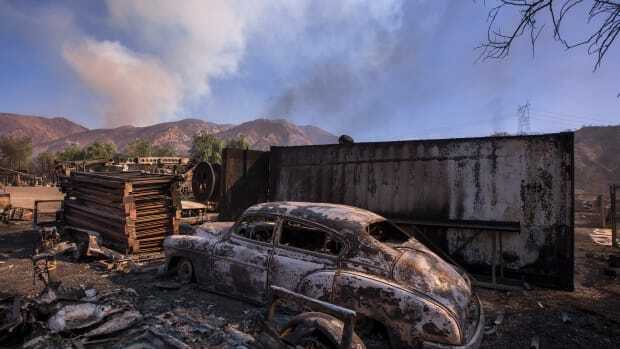 Strong wind blows embers across the smoldering ruins of a house at the Creek Fire in Sunland, California. 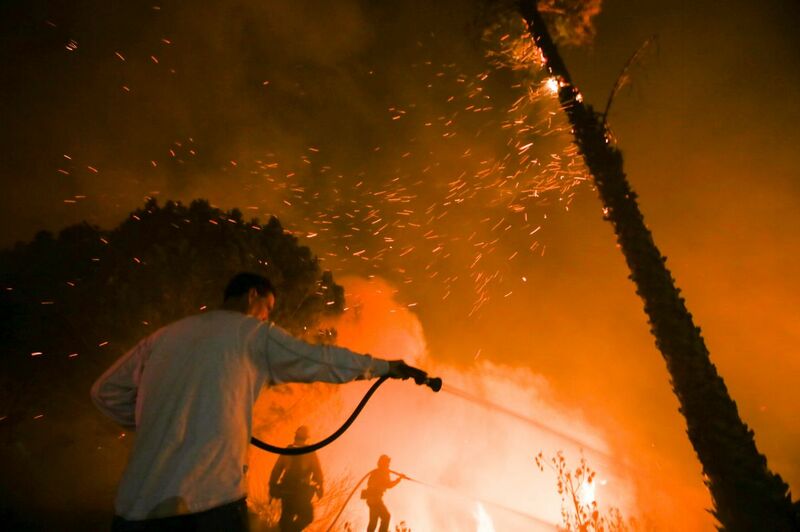 Strong Santa Ana winds are rapidly pushing multiple wildfires across the region, expanding across tens of thousands of acres and destroying hundreds of homes and structures. 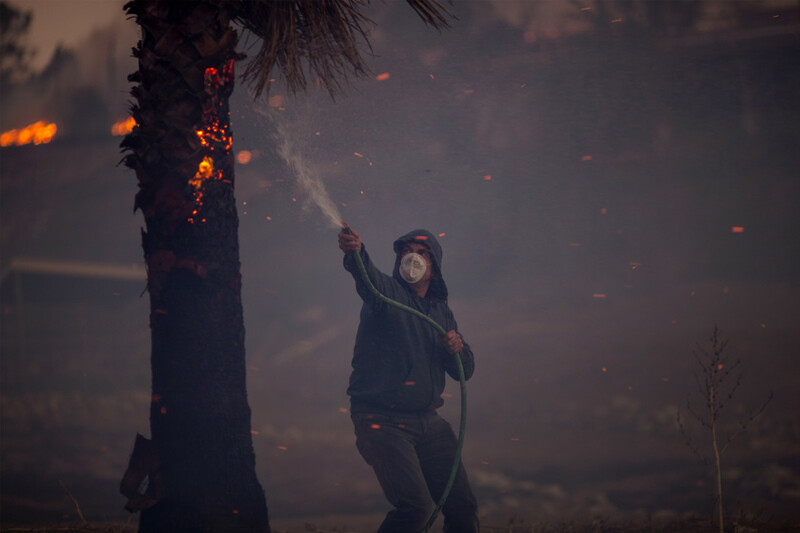 A resident hoses a burning palm tree during the Creek Fire. Spectators watch as the Creek Fire burns along a hillside near homes in the Shadow Hills neighborhood of Los Angeles, California. 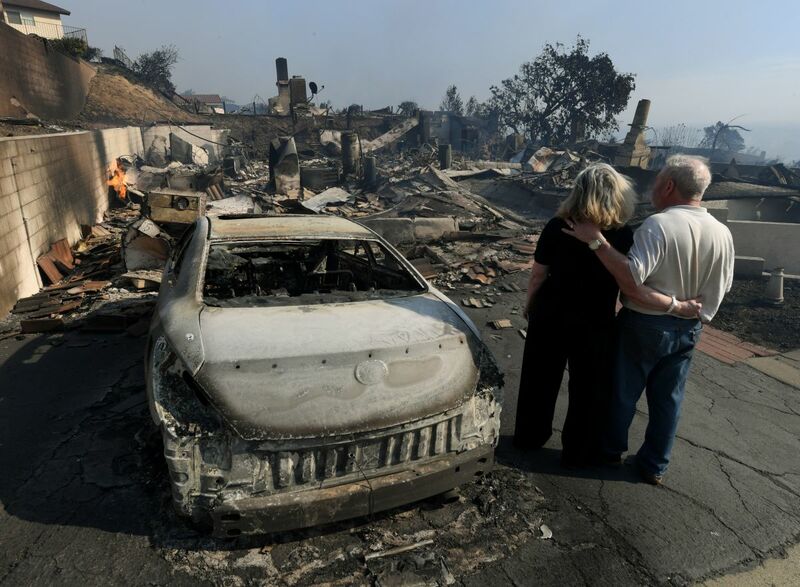 Michael and Vonea McQuillam stand beside their house that was burnt to the ground during the Thomas wildfire in Ventura, California. 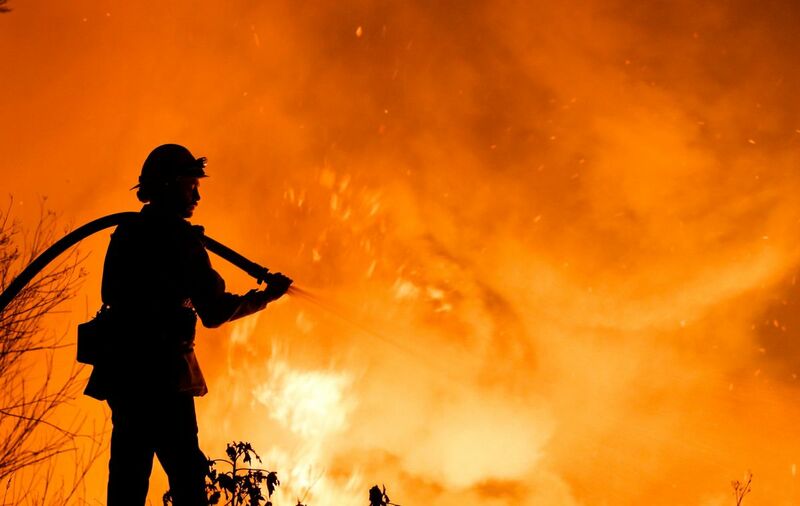 If you're following coverage of wildfires, or trying to stay safe, here are some helpful definitions to know.